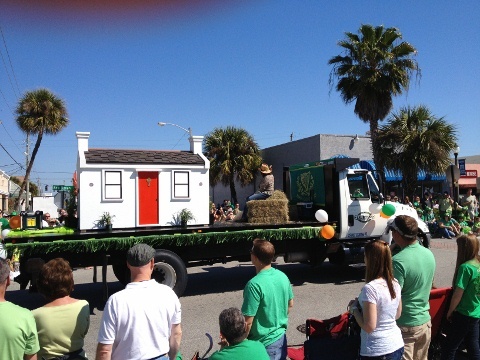 Thanks to Mike Smith, he sent me this picture he took of our float in the AOH St. Patrick's Day Parade in downtown Melbourne, March 16, 2013. Also there but not shown, my daughter, Tara and her husband, Brendan. They looked great. Handing out candy, they could hardly keep up! We had about three days of labor, constructing the cottage. Based on an image found on the web, we tried to simulate the slate roof with Certainteed Presidential shingles, custom fabricated aluminum drip edge and copper ridge cap. The chimneys would have allowed for a dry ice "smoke" if we had had the time to get it together. Thanks to all who had a hand in it!